For a list of ways you can take part, please visit the “Take Action” section. This page will provide you with information on what actions you can take to forward a human rights campaign in your area. To become a member of United for Human Rights, simply fill out our online membership application. Tell people about humanrights.com and if you have a website or blog, create a link from it to ours. Obtain copies of The Story of Human Rights documentary film and the TV public service announcements and show them to friends and associates. Support human rights education by signing the petition to implement the Universal Declaration of Human Rights. Tell others about humanrights.com and tell them to sign the petition. Create human rights awareness events or projects. Start a human rights chapter in your community. Encourage your local TV stations to air the public service announcements and/or The Story of Human Right documentary film—and arrange showings of these in public venues such as school closed-circuit televisions, student assemblies, clubs, theaters, etc. 2) Promoting implementation of the Bringing Human Rights to Life curriculum: We offer our Bringing Human Rights to Life Education Package for free as an aid to educators who teach college-age students and adults in classroom, group instruction or community learning settings. 3) Making charitable contributions to United for Human Rights International: Your generous support makes our campaign possible. It enables us to make our educational materials available free of charge to educators. While we are informing affiliates in your area who will be most interested in your wish to participate in United for Human Rights activities, we encourage you to have your own Bringing Human Rights to Life educational materials, which you can order online. The next step is for you to get started. You will find all the information you need to get started on our Take Action page. For basic information about the human rights campaign, view our United for Human Rights information kit. For information on the full education materials package, view our Bringing Human Rights to Life Education Package. Our materials are free for educators. 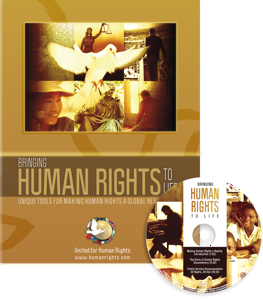 If you are not an educator, you may purchase the DVD and booklet online, or or go to downloads and select any of our free downloadable materials provided by United for Human Rights. As the United for Human Rights information kit is geared exclusively to educators who teach students in an elementary, middle or high school classroom – or who teach through group instruction or community learning settings – we offer it as one free kit per educator. This is to clarify, then, that the kit is a tool to help the educator learn more about the United for Human Rights education curriculum for use in their classrooms and/or communities. If you do not teach in a classroom or group learning venue, yet you would like to learn basic human rights principles – or have our materials to help make human rights a reality in your community – we recommend that you purchase our The Story of Human Rights booklets and/or our The Story of Human Rights Film. You can also download all of our materials for free at our Downloads & Resources page. In either case, we appreciate your interest and initiative. We very much appreciate your interest in our human rights educational tools. The Bringing Human Rights to Life Education Package is specifically for educators and/or those who direct and supervise educators. We want to make sure that every package and educator's guide is actually put to use in an educational program that results in those who know their and others’ human rights and are inspired to become advocates for tolerance and peace. If you qualify on that basis, sign up for the Educator's Package. And, while this is not a pre-requisite to your receiving the package, we appreciate and will put to good use any video footage and/or photos you can provide, especially featuring your use of our materials in an educational setting. This is invaluable to our efforts to continue providing these materials to you and other educators for free. This is only possible when our sponsors generously respond to the successes that result from putting our Bringing Human Rights to Life materials and lessons to work. If you do not teach in a classroom or group learning venue, yet you would like to have our materials to help make human rights a reality in your community, we recommend that you purchase our The Story of Human Rights booklets and/or our The Story of Human Rights Film. You can also download our materials for free on our Downloads & Resources page. In either case, we very much look forward to providing you these materials to support your human rights education efforts. Our apologies if your ordered package seems to be taking its time getting to you. Our free packages ship via postal services and typically take 2-3 weeks for delivery in the US. Overseas shipments can sometimes take up to 6 weeks. For your immediate use while you wait, you can access all of our educational materials by downloading them from our Downloads & Resources page. There, you can download the Bringing Human Rights to Life Educator’s Guide (in full, or lesson-by-lesson) and each element of each lesson: 30 “Do You Know Your Rights?” posters, The Story of Human Rights? booklets and each of our video properties: The Story of Human Rights documentary film, 30 public service announcements and UNITED music video. You can also make use of our online human rights education curriculum and, without a moment’s delay, begin teaching lessons online. Yes, you may use our materials. That the Trademarks be respected. That the materials stay intact, not excerpted or edited. That credit is given to United for Human Rights. That it is not part of any other program, but collaborates in a partnership capacity with other programs and is recognized as a United for Human Rights video. That is any edits are involved, the finished property be submitted for final approval to coordinator@humanrights.com. That no profit are made from its use. As our human rights activity is an educational campaign, United for Human Rights does not offer legal assistance. So, if you're in need of legal advice, know of and need to report a human rights violation, etc. please visit our Human Rights Organizations page to find an organization that best suits what you need assistance with. To view reports on human rights, visit our Human Rights Reports page. We very much appreciate your interest in helping to create partnerships or affiliations with United for Human Rights that will raise awareness of human rights and make them an everyday reality in your community. United for Human Rights International is regularly approached by private organizations and government agencies wishing to partner with us and use our materials and activities in their own programs. This at times includes requests for authorization to publish and distribute customized versions of United for Human Rights publications, as well as broadcasting, displaying or otherwise featuring all or part of our audiovisual productions in public and online forums. United for Human Rights International has entered into such partnerships with private and government institutions in countries around the world, including the United States, Mexico, Venezuela, Italy, Nepal, Ukraine, Taiwan, Zimbabwe, South Africa and many others. Depending on local regulations, a separate affiliated corporate entity may be required. If so, such requirements are addressed on a case-by-case basis. In all cases, however, any use of the United for Human Rights name or trademarked logo requires our express written authorization. Thus any such proposals should be submitted in writing to the United for Human Rights Coordinator at: coordinator@humanrights.com. And for local partnering needs that may require more specific advice or direction from us, you may submit your inquires to: coordinator@humanrights.com. We very much appreciate your interest in an exchange to United for Human Rights International for our free educational materials. Our ability to retain the support of our generous contributors—and continue to make our materials available free of charge—depends on keeping our benefactors regularly briefed on our program activities and accomplishments. This is best achieved through audiovisual presentations and personal feedback from educators and others who are successfully putting United for Human Rights materials to use. 1. Videos and Testimonials: Nothing is more gratifying to contributors than seeing the results produced by the materials and programs their donations fund. By keeping our supporters briefed with audiovisual presentations of the program in action and the filmed testimonials of users of our materials and curriculum United for Human Rights International continuously earns their support. Within the limits of our resources, we provide technical assistance to professionally film (and photograph) human rights education sessions, local human rights awareness activities and events, and personal testimonials about the impact of the program from participating educators and students. We respect all privacy concerns by having participants (and their parents/guardians where required) sign any requisite waivers. And we give the participating entity final editorial authority concerning the content and use of our footage, which we also share with them for their own use. Also valuable in promoting the results of our program are written testimonials on institutional letterhead. As part of The United for Human Rights Educator’s Guide, we provide before-and-after-program surveys. We encourage the use of these assessment tools by each educator who implements the United for Human Rights curriculum, and we welcome all outcome reports. To keep constantly abreast of participant reactions and program results, we also periodically send out surveys to individuals who have obtained and are using our materials. Anything you can do to provide both of the above is frankly like gold to us. If you have an idea of what that could be in your circumstances, please do not hesitate to submit it to our United for Human Rights Coordinator at: coordinator@humanrights.com. If you have questions which are not covered in the list above, contact us. © 2008-2019 Объединяйтесь за права человека Все права защищены. Логотип фонда «Объединяйтесь за права человека» принадлежит фонду «Объединяйтесь за права человека».